Thanks to Damen Fletcher, Founder/Executive Director of Train of Thought, that 15-year-old found a new purpose in his uncertain life in South L.A. Chess had given him a new self-esteem and confidence, reflected in his higher grades. Most importantly, his growing skill had shown him that he could be somebody. "The kid's love that. It's like a war game." He took to the game naturally. The thousands of famous strategies devised as early as the 15th century mesmerized him. The King's Indian Defense, the Sveshnikov variations, the Sicilian Defense, the Queen's Gambit … the names sounded like they were out of spy movies. 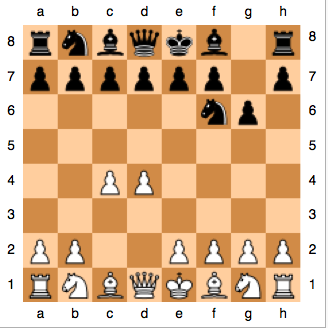 Black's preliminary King's Indian Defense moves. Bobby Fischer used a modern version with devastating success. Spreading the gospel of chess became Damen’s life work. Today, students are enrolled in Train of Thought’s Chess Education program at more than 14 elementary schools, middle schools, and youth programs in the greater Los Angeles area. Train of Thought has introduced nearly 3,500 youths to the game of chess, since it was founded in 2007. The chess master was also awarded the 2012 Los Angeles Urban League Young Professionals (LAULYP) ‘Divine 9’ Award for outstanding community service. He was also honored with a NAACP Men of Valor Award. The academic gains of Train of Thought students resulted in Damen receiving a UCLA research grant to study the effects of chess play in children with behavioral challenges and struggles with substance abuse. 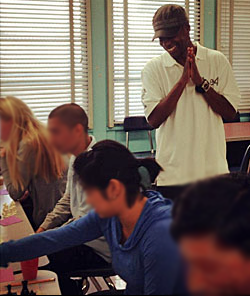 Train of Thought founder Damen Fletcher in his classroom element. Train of Thought has been picking up speed each year. The non-profit was recently chosen to design, develop, and implement, a chess curriculum for Celerity Education Group’s Family of Charter Schools. Fletcher first introduced the chess experience to the Celerity School principals through a weekly class. Next, Celerity’s after school personnel received lessons. Damen used unique techniques, which also stimulated elementary and middle school students' enthusiasm for the game. Chess is now facilitated during nutrition breaks, lunch and after school times at the Celerity educational facilities. 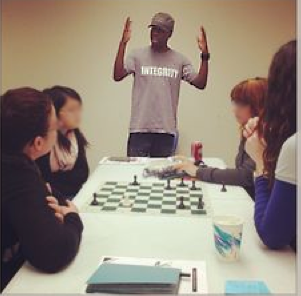 Fletcher first introduced the chess experience to the Celerity School principals through a weekly class. Next, Celerity’s after school personnel received lessons. Damen used unique techniques, which also stimulated elementary and middle school students' enthusiasm for the game. Chess is now facilitated during nutrition breaks, lunch and after school times at the Celerity Schools. "When I was first formulating my program for schools, I asked a group of teachers how many of them knew how to play chess. When only one person raised their hand, I knew who my first students would be. Once I was able to engage the teachers, their excitement helped open their students' minds to the competitive elements of the game." Danna Kiel, a mathematics teacher, describes her first meeting with the chess proponent years ago. "I met Damen when he was promoting the company and handing out chess flyers at the Crenshaw Starbucks. I asked him a ton of questions about my 8 year-old son learning chess. When he taught my son the basics in one lesson, my son and I both were hooked. His level of engagement with kids is amazing. He truly inspires them." 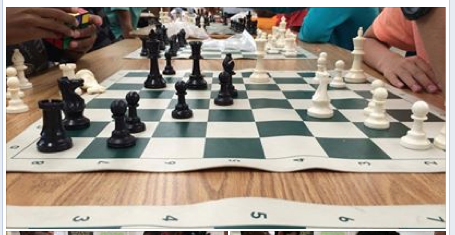 Damen hosts a monthly chess tournament with fast 10-minute matches at the Train of Thought headquarters. The atmosphere is always electric as dozens of youths and adults spar across the chessboard. Strategies reshape with each opponent's move. Not long ago, onlookers watched in amazement as Damen's 7 year-old daughter, Zoe, expertly whipped chess pieces across the board—defeating opponents twice times her age. 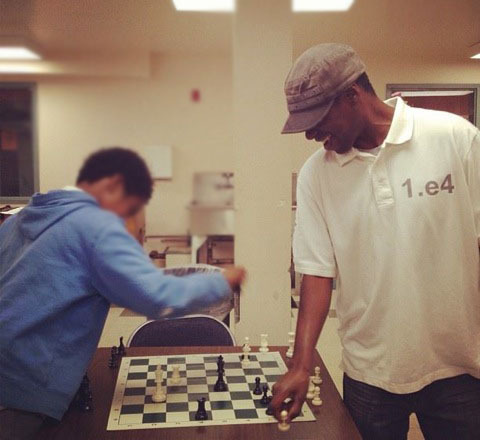 “I started teaching Zoe chess when she was just one-year-old,” Fletcher said proudly. For more information about Train of Thought and their program visit www.chesstrain.org or call 323-533 6891.